The Port Authority of New York and New Jersey is rethinking plans to move its Midtown bus terminal a block west and is now considering renovating the existing station. The bi-state agency ordered a study of its current bus terminal to assess the cost of revamping its existing facility. Officials have estimated that moving the terminal would cost $10 billion. Earlier this year the Port Authority dedicated $3.5 billion to creating a new terminal. 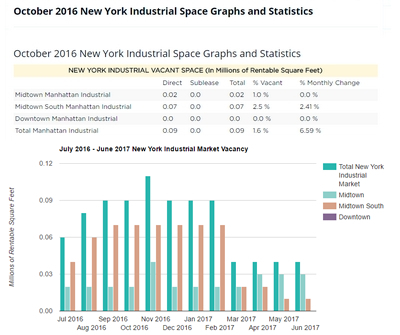 The borough’s hoteliers saw revenue per available room dip to its lowest point of the current cycle, as the hotel market struggles to absorb new supply. 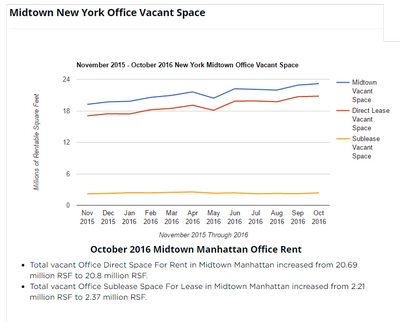 Manhattan is expected to add more than 4,500 new rooms in 2017, with fewer coming online in the years following through 2020. 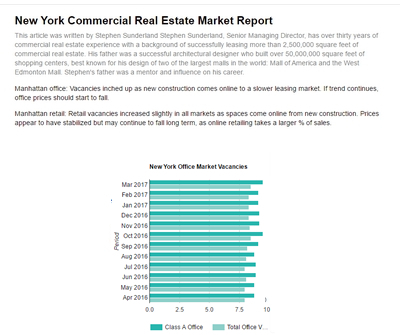 SL Green Realty may have a harder time than anticipated to fill its One Vanderbilt with tenants amid a lackluster Midtown office market. So far, SL Green has only signed one tenant, TD Bank, which will take 200,000 square feet in the planned 1.7-million-square-foot tower. 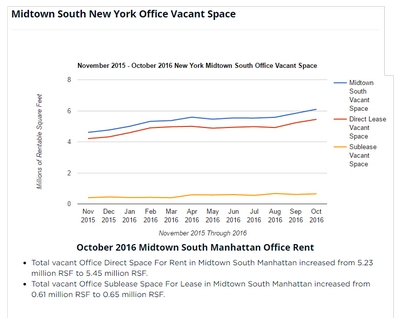 SL Green hopes to get an average rent of $150 per square foot in the tower, way above the current Midtown average of $80.00. 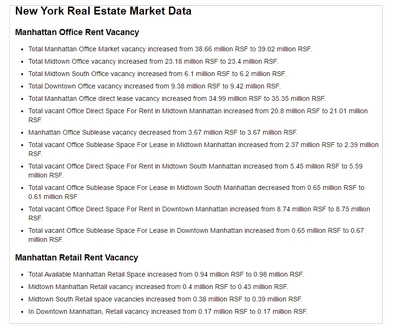 Manhattan has seen chain stores have a net loss of 24 chain stores last year to a total of 2,715. The number of chains across the five boroughs climbed 1.2% last year. 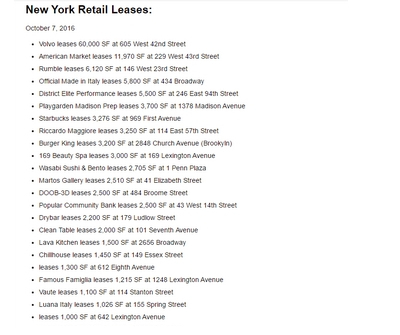 There was a 1.2% in the number of chain stores that opened in the city in 2016. 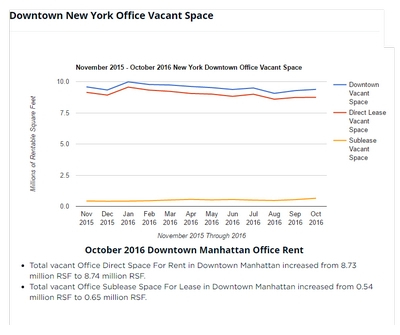 Manhattan saw a .9% decrease from 2,739 in 2015 to 2,715 last year. Similar decrease the year before. 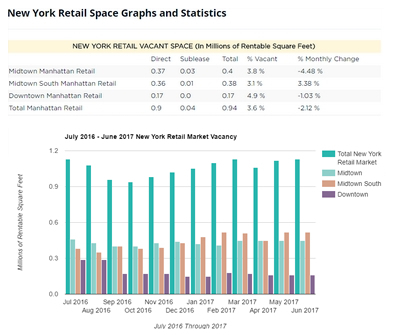 Subway, Manhattan’s fourth-largest chain, closed a net total of 15 stores in the borough last year, while T-Mobile and McDonald’s also closed a few stores. Investors Brad Reiss and John Yoon are facing foreclosure on their Mansfield Hotel in Midtown, which has been bleeding cash for more than a year as they negotiated to sell it at an asking price of $65 million. Lord & Taylor is mulling over a plan to redevelop its 103-year-old Fifth Avenue flagship store into an office-and-residential tower with room for the retailer’s business at the base. The plan would preserve the 11-story building at 424 Fifth Avenue while constructing a glass-and-steel skyscraper above. Ivanhoe Cambridge is in late-stage talks to buy Goldman Sachs’ former headquarters at 85 Broad Street in Lower Manhattan for around $650 million. Save Gansevoort, a group of community activists opposed to the project at 46-74 Gansevoort Street, won an emergency stay from an appellate court to temporarily halt the commercial development. The developers are turning five buildings on the strip into 111,000 square feet of commercial space. Haim Nortman, a Brooklyn landlord, is planning to build 71 units at 362 West 125th Street in Harlem. The permit plans show a 94,538-square-foot building, including 73,020 square feet for residential and 21,517 square feet for commercial space. 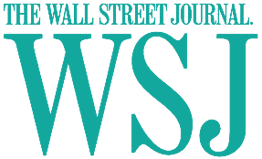 Private equity firm Savanna hopes to build a 27-story boutique office building at 106 West 56th Street, Manhattan. The filing calls for a total square footage of 74,469 square feet, but a spokesperson from Savanna told the company is planning to build a 90,000-square-foot tower. Lemor Development Group is planning 79 residential units at 407 Lenox Avenue. The project is called the Robeson, and would span a total of 82,124 square feet. The developers have set aside 72,108 square feet for residential use. There is also 7,498 square feet dedicated to commercial space and 2,518 square feet for community space. 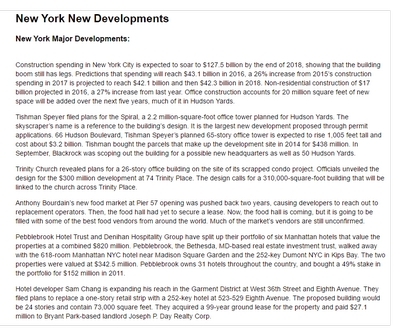 Lam Generation is planning to build a hotel at 113-117 West 24th Street site after a $60 million deal to sell it to Sharif El-Gamal fell through. The site is currently contaminated and has been undergoing a lengthy clean-up. David Brecher and partner JBS Project Management filed construction plans to convert a Vinegar Hill warehouse at 84 Hudson Avenue to offices. Construction plans for 84 Hudson Avenue call for a 68,434-square-foot conversion, with seven floors of office space, including first floor retail. 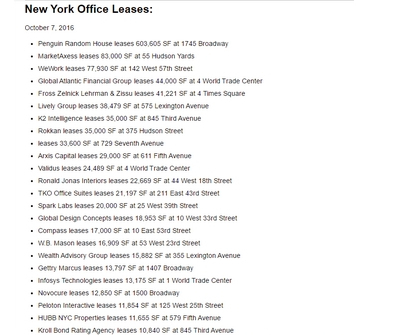 Banks are aggressively lending on commercial properties even as developers and equity investors are starting to pull back amid fears of a downturn. 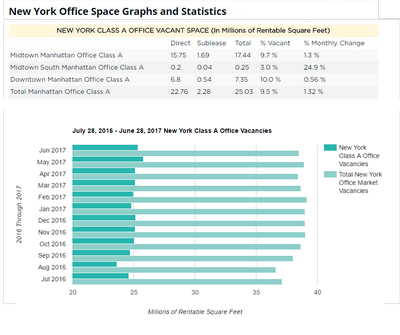 The city is holding off on letting its agencies lease space at new and existing offices, a possible sign that officials are waiting to see the impact of federal cuts before committing to long-term deals. Developer Tribeach Holdings filed plans for a 27-story hotel at 145 West 47th Street. The hotel, situated between Sixth and Seventh avenues, would feature 343 rooms on 141,558 square feet of residential space. The building would include a parking area on the second, third, and fourth floors, and a restaurant on the fifth. Floors seven through 26 would each include 17 rooms, with an additional three rooms on the sixth floor. Douglaston Development is looking to buy more than 150,000 square feet of air rights from the Hudson River Park Trust for a planned 1.1 million-square-foot, mixed-use development south of Hudson Yards. 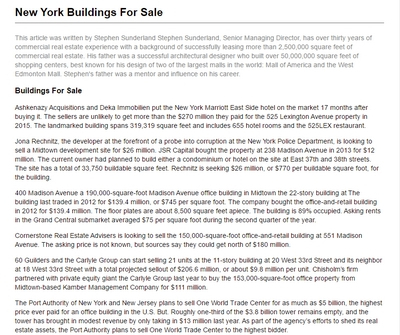 Jeffrey Levine’s development company is looking to rezone properties it owns on the block west of 11th Avenue between West 29th and 30th streets and the firm wants to purchase sets of development rights from Hudson River Park totaling around 150,000 square feet. Douglaston wants to build a pair of towers with up to 1,230 new apartments. One would be a 62-story building with 990 units and 15,000 square feet of retail at 601 West 29th Street, while the other would be planned as a 32-story mixed-use building with 206 units at 606 West 30th Street. Council member Rosie Mendez threatened to veto the planned Union Square Tech Hub building unless the surrounding neighborhood is rezoned to prevent further development. RAL Development Services plans to build a 258,000-square-foot office building at 124 East 14th Street. But the project will still have to go through the Uniform Land Use Review Procedure (ULURP) process, meaning it requires City Council approval. The council generally defers to the local council member, so Mendez effectively has veto power over the project. Ralph Lauren abruptly shuttered its Fifth Avenue flagship at 711 Fifth Avenue but the struggling fashion house is still paying nearly $70,000 a day in rent. Not only has another tenant not stepped in to take over the space, but the owner has not yet marketed the 39,000-square-foot retail block. Intercontinental Hotels Group secured $290 million to refinance the New York Barclay hotel in Midtown East. Deutsche Bank is the lender on the 14-story hotel at 111 East 48th Street. The loan includes $7 million in new financing, and replaces the remaining balance of $283 million in previous loans from the same lender. Apple’s iconic glass cube outside the General Motors Building is coming down temporarily as the retailer renovates its store. Apple is expanding its flagship location from 32,000 square feet to 77,000 square feet. Apple is temporarily taking the former FAO Schwarz space before Under Armour takes possession.